It is a pleasure coming across intellectually stimulating content in what is perennially known as a trivial medium. I haven’t had much pleasure of reading autobiographical materials in the form of comics before. It is nice to start with one like You Don’t Say by Nate Powell. The only thing I have recently read that was remotely similar to a highbrow graphic novel was a book by Victor Hussenot titled The Spectators. Yes. That was good. 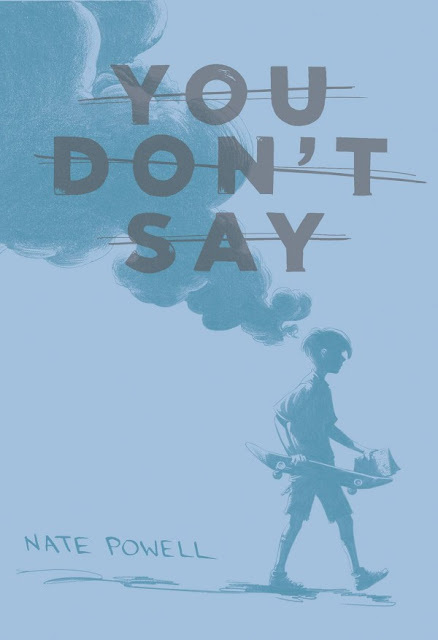 You Don’t Say by Nate Powell is a collection of short stories (some autobiographical and previously published) about various issues and the author’s perspectives about them. The issues on display ranges from disability to racism to the complexities of growing old, among other things. Each of the stories is preceded by a short note from the author explaining the reason or the circumstances behind the story’s birth. Have I mentioned that most of the stories are based on real-life events? Yes, they are, according to the author. What stands out in most of the stories in this book is the honesty and feeling. The stories are shamelessly blunt about the issues it addresses. It heightens this effect by combining it with excellent art. Also, the dialogue is good and its sometimes introspective quality gives off a philosophical feel. At the risk of sounding cliché, I will say You Don’t Say is quite a deep book. While it steers clear of giving you a predictable ending or a moral lesson or whatever some people look for for a closure in a tale, it shines a hopeful light on the plight of human existence. You Don’t Say is a unique graphic novel. The art is good is most places, though there are some panels where the quality doesn’t match up to the rest of the book. But these are few and far in between. The dialogue holds up and there are some beautiful turn of phrases on few of its pages. Where the book shines most is the feeling it conveys when discussing controversial topics and the way it reveals hidden emotions that readers can identify with. You Don’t Say is a solid addition to the genre. Many thanks to Diamond Book Distributors for review copy. All images are © to their respective owners.